Dr. Obianuju (Uju) Mbamalu is an endodontist at Tribeca Advanced Dentistry. Dr. Uju moved to New York City at a young age from Nigeria and grew up in Harlem, New York. She received a Bachelor’s of Science degree in Sociology from Vanderbilt University. 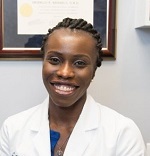 Dr. Uju completed her Doctor of Dental Medicine degree at Rutgers University School of Dental Medicine, spending her last year at the Community-Oriented Dental Education program. The desire to help patients to preserve their teeth and smiles led Dr. Uju to become an endodontist. She was acceptance into the University of Pennsylvania residency program, where she earned a Certificate in Endodontics while learning modern endodontic and microsurgical techniques from some of the most accomplished specialists the endodontics field. Dr. Uju is an attending faculty member at Harlem Hospital’s General Practice Residency program (affiliated with Columbia University). A fully-licensed practitioner, Dr. Uju is on track to become board certified. Dr. Uju also has her Basic Life Support (BLS) and Advanced Cardiac Life Support (ACLS) certifications. An active participant in the local dental community, Dr. Uju is an active member of the American Association of Endodontists (AAE), New Jersey Dental Association (NJDA), Essex County Dental Society (ECDS) and American Dental Association (ADA) .